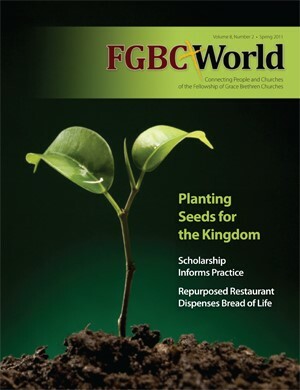 Information about church planting, topics of scholarship by Grace Brethren pastors, and a look at the news of the Fellowship of Grace Brethren Churches is all found in the new Spring 2011 issue of FGBC World, the quarterly magazine for the people and congregations of the Fellowship of Grace Brethren Churches. The magazine is currently in the mail to individual subscribers and will be delivered in bulk to Grace Brethren Churches. If you’d like a sneak peak at the content, check out the FGBC World website, fgbcworld.com.